Mega-City One, 2080. Judge Joe Dredd's first year on the streets as a full-eagle Judge. Bred for justice, trained in law, Dredd's no helpless rookie, but he's not the seasoned veteran we know either. Three tales follow the first adventures of the future city's greatest lawman. With an introduction by the Mighty Tharg! CITY FATHERS The brutal murder of a Justice Department-sanctioned spy uncovers something new and dangerous in the sector's murky black market. Unless Dredd can stop it, chaos will be unleashed. COLD LIGHT OF DAY A savage killing spree results in the deaths of two highly-regarded Judges, and many consider Dredd to be responsible: a decision he made five years earlier - while he was still a cadet - has come back to haunt him. WEAR IRON "Wear iron, that's the rule." Paul Strader is a stick-up man, and a stone cold professional. But when he gets in over his head, he has to risk everything on the word of a corrupt lawman and break every rule he has. Every rule but one... 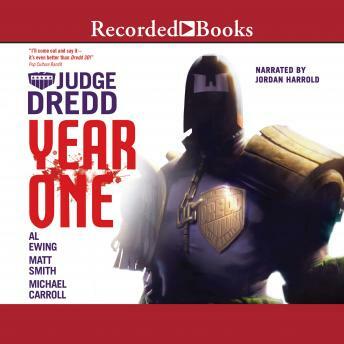 Author bios: Michael Carroll, Al Ewing and Matthew Smith are three celebrated novelists and Dredd comics writers. Smith, also the editor of 2000 AD, has written two previous novels for Abaddon and Black Flame and the comics series Dredd Year One for IDW. Ewing is the author of The Fictional Man for Solaris and five novels for Abaddon. Carrol is the YA author of Quantum Prophecy and The New Heroes series.